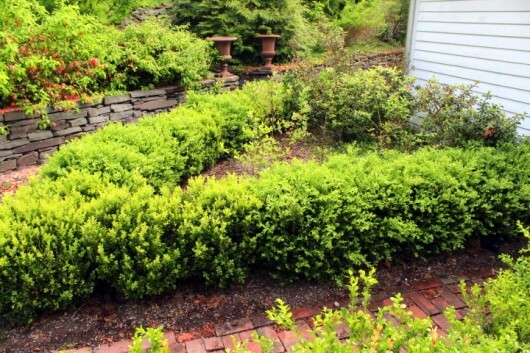 Before: The Boxwood Garden, with 320 scruffy-looking shrubs. Just looking at this picture makes me wince. After: Quelle différence! The shrubs’ stature and width was reduced by six inches. The lines of the geometric beds are now crispy defined. 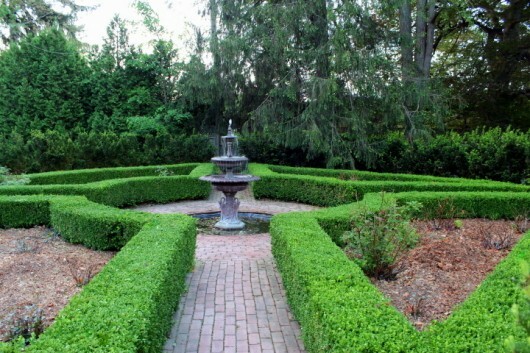 Before: Even this fountain was embarrassed by the boxwoods’ unkempt appearance. It refused to flow. After: The same fountain, gushing with glee! Before: The boxwood that surrounds my blueberry patch needed a clean-up, too. What to do with the thousands of boxwood bits after a big trimming-job? You can use them to make new plants. That’s how I obtained most of my boxwood in the first place. Here’s the how-to. 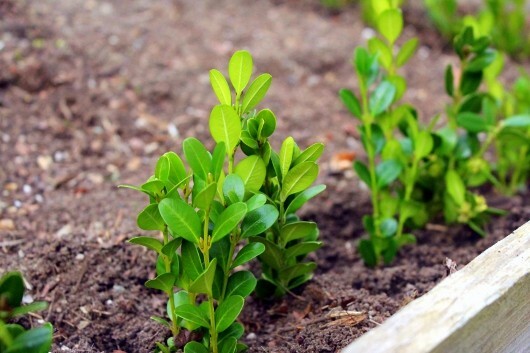 Thinking of starting your own boxwood garden? Just do it, baby. The shrubs are a cinch to propagate. They are drought-tolerant, too. Just give them a yearly trim, and you’re good to go! 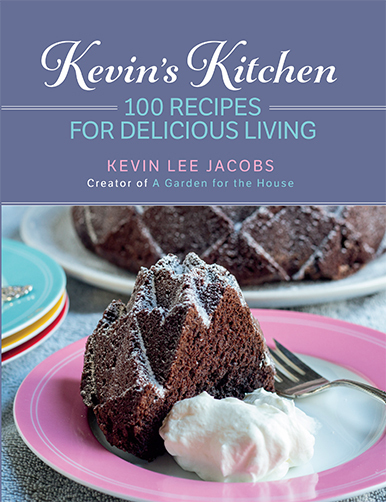 Don’t miss anything at A Garden for the House…sign up for Kevin’s email updates. Wow –Simply amazing–beautiful facelift-ready for summer!! Gorgeous! What’s the evergreen shrub growing along the perimeter of the garden? And to think this was a parking lot when you bought the house. Truly stunning. Magnificent! Beautiful! Stunning! Are there enough or sufficient adjectives to do justice? This gives me an acute case of boxwood envy. Good lord they take forever to grow! I’m still waiting for mine to get a move on. The new growth is always so small that I can’t imagine where I would get cuttings large enough to use to propagate. I LOVE boxwood. 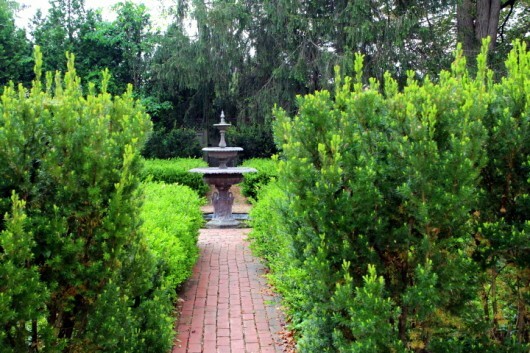 My grandparents owned a farm in southeastern Virginia and there were huge old boxwoods all over the place. Some years after they died and the farm passed out of the family, a neighbor was kind enough to make a rooted cutting from one of the plants to give me on my next visit south. I have a huge boxwood on the northeast corner of my house, q child of my grandmother’s boxwood, and now I will make some more cuttings! Many thanks for this very helpful post. Please do a piece on iris sometime. I also have some of my grandparents very old strains of iris as well, and they bloom reliably and happily next to my Immortality and Before The Storm, my two modern favs. Samantha – Loved hearing about your grandparents’ farm. You are living proof that boxwood can be passed from generation to generation. I have two nice little boxwood globes propagated from cuttings many years ago. Recently I bought a full sized variegated specimen of boxwood, really lovely and pyramidal in shape. My May to-do list is 10 feet long but I will add this: “Stop procrastinating and take boxwood cuttings like Kevin says”. Absolutely beautiful. I can’t wait to see your garden in bloom. What a fabulous place you have. Love I,live it! So beautiful, Kevin. I just love your gardens. Your boxwood is always so beautiful! I was behind a woman at Home Depot last week. She had a beautiful boxwood and was excited to get it home. Terrified that she was gonna kill it somehow, she nervously laughed and said, “it’s pretty pricey but, no risk! If it dies within a year, they will replace it!” I told her to check your blog out. She had no idea she could take cuttings and root them! I enjoy your blog and I love spreading your gospel! You have a light, Kevin…keep shining bright! 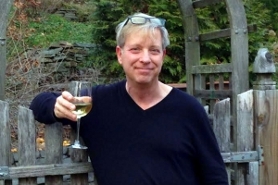 Hi Tracey San – Thanks for spreading the word! 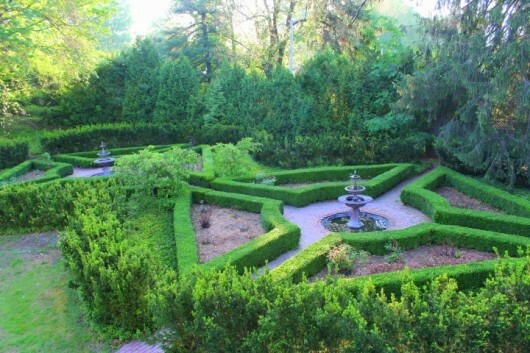 Your boxwood garden is just stunning! My lone boxwood took quite a beating in our New England winter but I’m hoping it will green up again. 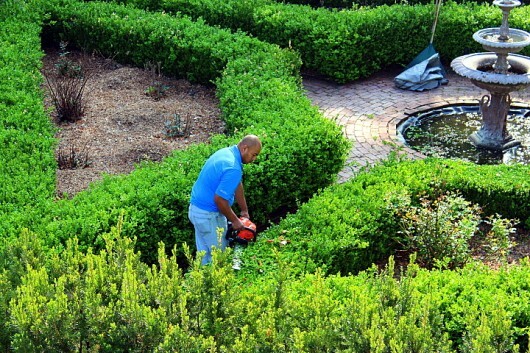 Kevin, your boxwood garden is absolutely spectacular! What a difference a good trim makes, Boxwoods ROCK! Kevin……SOOO NICE…..AND NEAT!!!! LOVE IT TOO!! So very nice! I enjoy seeing your artistry every year. And, by the way, Your new pic in the kitchen is gorgeous. Thanks for sharing all you do. What is the variety of your boxwood? I love seeing your beautiful boxwoods! I love the shrub and long for some of my own. I tried propagating some last year and they died. I’ll try again and use your post. How old are the ones shown? Hi Cilla – Good news for you: Modern boxwood varieties (including those in my garden) have no scent whatsoever. Hi Martha – I have two varieties: ‘Winter Gem’ (planted in the big boxwood garden, and also along the garden shed path) and ‘Green Velvet’ (surrounding the blueberry patch). Winter Gem is the more hardy of the two — it yawns in the face of sub-zero temps and deep snow! What a difference a haircut can make. How does it hold up in an extremely cold area? I’m in a windy zone 4 in Maine. I’m proud of my baby cuttings I propagated last year thanks to your tip and instructions. All survived our very cold winter but one here in Ohio. Absolutely beautiful! In just 4 hours?!? Wow! By the way, the Bubble and Squeak was AMAZING!!! Thanks for the recipe! Doris Gaumont – My Buxus ‘Winter Gem’ has endured hurricanes, blizzards, and sub-zero temperatures without uttering a complaint. Super hardy. Peg – Kudos on your propagation efforts! Mercy Heston – So glad you liked the Bubble and Squeak! Hi Kevin, I love your posts! What is a boxwood-barber? Are you pulling our legs or is there something that picks up all those trimmings? Hi Kevin! It’s absolutely beautiful! I am so happy I found your site. It’s the best one I have ever see. I kid you not. Hi Sandy – My “boxwood barber” is the man you see in the top photo. He brought along an assistant who raked up all the trimmings. Mercifully. Hi Linda Haynes – What a nice comment. Thank you! Just beautiful. Your gardens are amazing. That blueberry tart looks so delicious. It wouldn’t have lasted long here either. The bpxwood garden looks spectacular. Now if only we had a soaking rain to keep it lush. I’m so tired of watering so early in the season. Concerning a favorite recipe, Bread sticks wrapped in BACON, are scrumptous!!!!!! 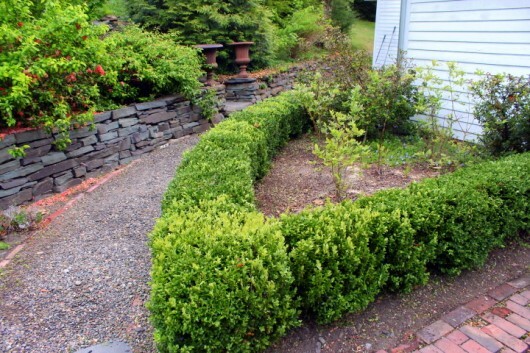 I was told once that boxwood should not be sheared and should be hand trimmed with scissors. Do you notice any ill effects from shearing ? Hi Diane – No ill effects from shearing. Just lush, green growth! How did the “barber” make sure the trim lines were straight and level? What an absolutely beautiful garden. I was thinking about starting a boxwood garden next season, and now that I’ve seen yours, I am definitely going to! 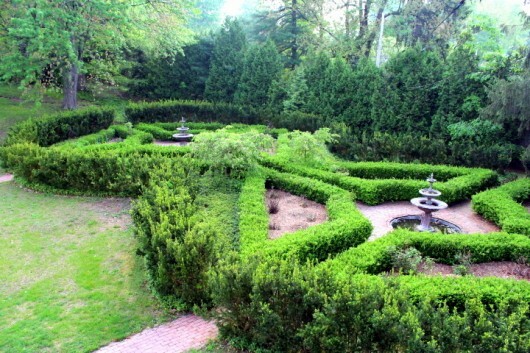 With the right grooming, I think boxwood gardens add such an extravagant touch to any yard. My yard will need a lot of cleaning up before I can plant, but it will be well worth it. Wow, your Boxwoods seemed to have grown a lot for one year. That’s why I’ve decided not to get Boxwood because they grow so slow, supposedly like 4″ per year, and it would take 5 years for them to grow to the hedge that I want to be 2 and 1/2 feet. Am I wrong? Could I ask what type of Boxwood you have? Thanks in advance.